Over the past number of days I've seen two movies that have been out for awhile. One is an homage to Speilberg-styled films full of shocks, special effects, humor, action, and a bit of romance. The other is a foul-mouthed comedy that tries too hard. Guess which one I liked more based on those descriptions alone? 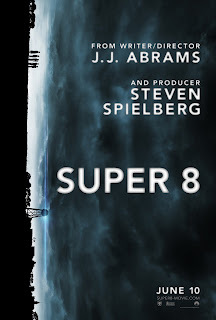 Super 8 has been talked about as being a love-letter to Steven Spielberg (I even mentioned that in my intro), but that could cause one to worry the movie doesn't stand on its own. That isn't the case. This film is quite intriguing and fun and not just a mish-mash of scenes paying lip-service to Spielberg so much as the film has a feeling of that Spielberg magic some of his flicks maintained. You know, that sense of wonderment and feeling of amazement when you look at the world and everything that makes it up. Speaking of amazement, I liked how the movie didn't show you the alien very well until quite close to the end, and boy was it one ugly sucker. The real stars of the show are the kids however. Whether it is Joel Courtney as Joe or Elle Fanning doing a great job as Alice--along with the other young boys who get less screen time but still are exemplary--the youth are great actors in this film and for a movie that hinges on their success as believable characters with good chemistry they nail it. Super 8 is about a big monstrous-looking alien, Bad Teacher is about person who acts like a monster. Elizabeth Halsey is just lazy, cruel, and interested in getting through life as easily as possible. I guess by the end of the movie she has grown a bit as an individual, but she actually is still kind of a jerk. Diaz does a decent job, but I actually enjoyed the supporting cast more, be it Lucy Punch as the increasingly-incensed-by-Diaz Ms. Squirrel, Justin Timberlake doing a decent enough job as a total dullard, John Michael Higgins as the dolphin-obsessed principal, or Jason Segel doing an incredibly great job as the gym teacher who has a thing for Diaz. Seriously, Segel seems to be putting forth more effort than this movie may have deserved. Oh, plus Thomas Lennon of Reno 911 fame pops up briefly for some delicious scenes. The thing is, when you have such a great supporting cast your main character really needs to shine, and Diaz does a good job, but casting her against her normal roles doesn't seem to pay off too well. She is believable as an all-around miserable person, but by having a main character we don't really like at all, it makes it hard to really root for her to succeed in her goals while being so terrible as a human being. Super 8 has an alien that isn't quite evil but does some bad things, Bad Teacher has a protagonist who is pretty much evil but does a few good things. I'm not too upset though, because the movie is called Bad Teacher. It just seemed more fun when it was Bad Santa and it was Billy Bob Thornton as the main character. Yes, he was a terrible person too, but you kind of pitied him and rooted for him. Also, what was with Bad Teacher using the exact same shot of that kid looking confused twice? I'm serious, it was the same clip, used two different times in the movie. Couldn't they have gotten the kid to do the reaction again instead of having an artificial feel from using a clip repeatedly? I just found that odd, not to be nit-picky. Bad Teacher kind of trails along until it reaches a semblance of an end, while Super 8 is very clearly and carefully designed with a feeling of acts, be it the opening quiet parts, things not being quite right after the big event that closes out the first third of the movie, or the crazy action in the last 45 minutes or so. Super 8 also is just gorgeous to look out. Bad Teacher has drab hallways and offices--which works for its theme--but Super 8 has a true feeling of being set in small-town America during the late 1970s when it takes place. Bad Teacher also leaves a variety of plot questions awkwardly unanswered, while Super 8 seems to cover everything pretty well. If we're honest, I laughed just as much during the extra bit of Super 8's credits (stay during the credits!) as I did during much of Bad Teacher. It's just kind of bad when a movie that wasn't advertised a comedy has as many laughs as the actual comedy movie. I enjoyed my viewing of both these films, but whereas I would go and see Super 8 again, with Bad Teacher I would not. Also, while I would recommend Super 8 to nearly everyone, with Bad Teacher I would attach my many caveats to anything positive I told a friend about it. Super 8 is still in many theaters and I would recommend if you haven't seen it to hurry out and do so. Bad Teacher has been out shorter and probably won't be in theaters as long either, which isn't too big a loss.